This Native American Unit is one of my favorite units! 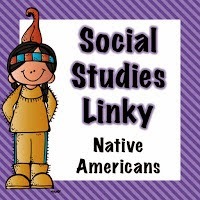 It motivates students to want to learn about the history of Native Americans of North America (Eastern Woodlands, Great Plains, Southwest, Northwest Coast, Southeast). It has informational text, comprehension, and engaging activities. For each region, there is a 2-page informational text that gives information about the climate, religious beliefs, resources, homes, food, etc. Along with the informational text, there is a different reading skill used for comprehension. This one shows context clues/vocabulary. Play it throughout the unit too especially while making one of the crafts. Students love it and will start singing along! This particular CD helps teach about Native Americans. A corn craft goes along great with discussions on harvesting in the Southeast. Students will have a printable with picture symbols. They can create stories with symbols using a section of a brown paper grocery bag. 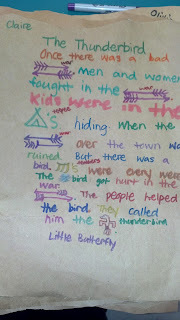 Directions for a Native American project is given where students can use the Informational Text to gather information. A rubric is provided for easy grading! While studying each region, students should fill in their study chart. There is a digital student version included great for integrating technology. Students map the regions by coloring the map according to how they create the map key. This craft works well with the Great Plains and has a writing activity. It includes the history of dream catchers, step-by-step instructions on how to make them, and a printable for writing about their dream catchers. To go along with the Iroquois League of Nations, students can write about what peace means to them. There are instructions on how to do a rain activity to go along with the Southwest region. There are 6 diffferent templates for acrostic poems. One for each region and one for Native Americans. There are 3 games to play with your students that require little or no materials and can be played with small and large groups. Students will be engaged while learning facts about the culture of each Native American region.